After launching over a year ago, we’re getting a successor to the Huawei Band 2 Pro wearable – the aptly named Huawei Band 3 Pro. Sure, most big-ticket items tend to receive yearly refreshes, but we’re a bit perplexed as to why Huawei has decided to bring out a successor to the Band 2 Pro so soon, especially when the new product doesn’t seem to shake things up too much in comparison with its predecessor. The design of the Huawei Band 3 Pro isn’t too dramatic, boasting nearly the same aesthetics as before. That’s not a bad thing in this case. As it’s geared for workouts, its design is meant to handle all the rigorous movements that tend to accompany sweaty exercises. Frankly, its design reminds us of the old Samsung Gear Fit from a while back, although the Band 3 Pro is not as refined or premium in nature. Nevertheless, it’s a simple design that’s more than satisfactory for workouts. We really like its vibrant looking 0.95-inch AMOLED touchscreen display. The color black has that distinguishable deep tone, while viewing angles are top-notch – the hallmark qualities of AMOLED technology. When it’s worn on the wrist and lights up, it’s definitely something that commands attention due to its iridescence. 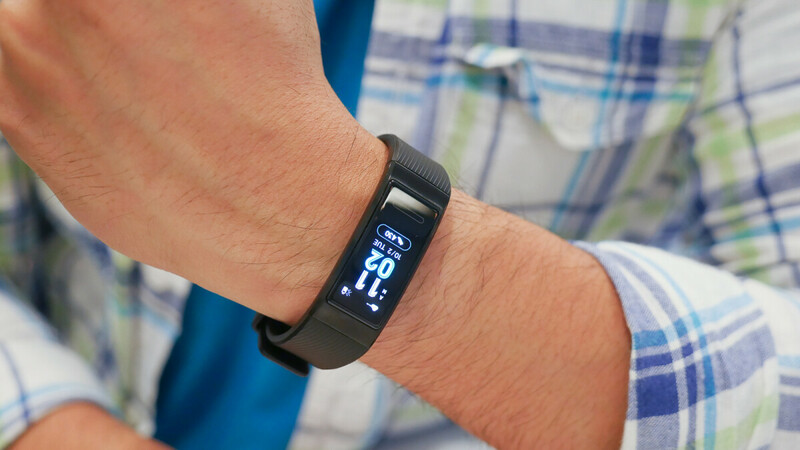 Functionally, the Huawei Band 3 Pro is similar to its predecessor in the way that it tracks sleeping and workouts, featuring the same AI algorithms found with the Huawei Watch GT to manage efficiency with its processing power. We didn’t get to dive deeper into its various workout, fitness, and sleep tracking modes, but we’re crossing our fingers that it’s able to deliver accurate results. The wearables space is a crowded one filled with several marquee offerings from the likes of Fitbit and Garmin to name a couple. Last year’s Huawei Band 2 Pro came in at a competitive price point of around $69 when it was launched, but the new Huawei Band 3 Pro comes in higher at around $114. That’s a considerable leap, but the main difference here is the move to a color screen – as opposed to the monochrome one with the Band 2 Pro. Now, if the Band 3 Pro is able to prove itself as a worthy fitness tracker that delivers accurate results and long-lasting battery, its higher pricing will undoubtedly justify itself. They should add wireless charger, so that Mate 20 Pro can charge this smartwatch wirelessly.